Chemotherapy works by killing cancerous cells. However, it is aggressive against rapidly growing healthy cells, too, like hair follicles.Hair follicles, the structures in the skin filled with tiny blood vessels that make hair, are some of the fastest-growing cells in the body. Since chemotherapy drugs circulate everywhere in the body, damage to healthy cells can occur at various places in the body. Chemotherapy can affect the hair on head, facial hair including eyelashes and eyebrows, pubic hair and body hair. . Hair usually begins falling out one to three weeks after the treatment starts. It could fall out very quickly in clumps or gradually. Accumulations of loose hair can be noticed on the pillow, hairbrush or comb, or in the sink or shower drain. The scalp may feel tender. The extent of hair loss depends on which drugs or other treatments are used and the duration. 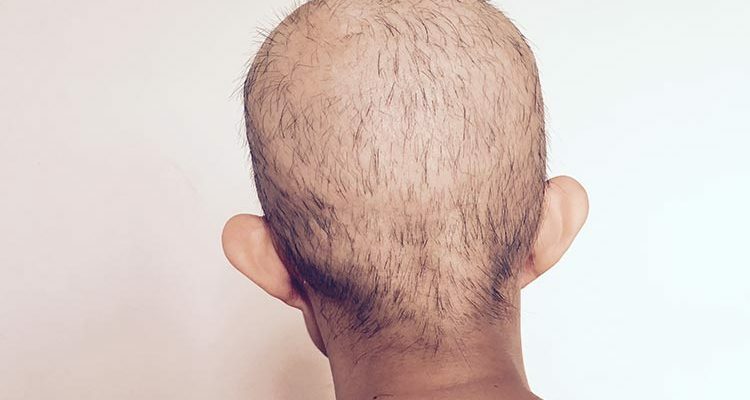 As each person’s individual medical profile and diagnosis is different, so is his/her reaction to treatment, and the amount of hair loss could vary. Hair loss can be emotionally devastating. Many patients feel that they can’t go out in public, or that they will embarrass their family members. It’s completely normal to feel this way. But one can do many things to make hair loss more acceptable and easier to cope with. The best way to deal with impending hair loss is to plan ahead and focus on making oneself comfortable with the appearance before, during and after cancer treatment. Purchase a wig prior to treatment that matches your hair colour. Cut hair short. Short hair is easier to maintain and allows wigs to fit more comfortably and makes it appears fuller. Some people choose to shave their heads when hair loss begins, since they feel it is less devastating to lose it all at once, than a little bit at a time. Many chemo patients use scarves or hats to cover their heads. Once chemotherapy begins one should not colour or undergo any chemical treatment eg perming / straightening during chemotherapy as it affects hair follicles. Use a gentle shampoo and mild conditioner, every 3 to 5 days to keep hair healthy looking. Rinse hair thoroughly and pat dry. Do not use blow dryers, as they are very damaging to the hair. Wear a scarf or hat when outdoors to prevent sunburn and heat loss. Fortunately, most of the time hair loss from chemotherapy is temporary. It may take several weeks after the treatment for hair to begin growing again. It can be expected to re-grow three to 10 months after the treatment ends, though the hair may temporarily be a different shade or texture. It might be curlier than it was before, or it could be gray until the cells that control the pigment in hair begin functioning again. Chemotherapy can affect the skin too. It may cause an increased sensitivity to the sun as well as redness, rashes, itching, peeling, dryness, acne and tenderness. Sometimes, chemotherapy causes the skin along the vein to darken. Usually the affected areas are limited to small patches. There may be some dry peeling, as the skin rubs off. The skin generally heals quickly and completely. The red reaction goes away the fastest. Chemotherapy can affect the skin’s natural moisture because it reduces the amount of oil that the glands secrete. To prevent dryness , use moisturiser more frequently. During the day, use a product that protects the skin from the sun, blocking UVA and UVB rays. Be sure to use a gentle, moisturising soap or cleansing cream, and avoid soaps with heavy deodorants or scents. Take quick showers or sponge baths, not long, hot baths. Soaps for babies may be a good choice because they’re usually mild and perfume-free. Apply cream or lotion to skin while it is still moist. Avoid perfume, cologne, or aftershave lotions that contain alcohol. Stop smoking as it constricts blood vessels . Radiation treatment causes severe changes to the overlying skin and there is an increased risk of developing skin cancer in the future. Thus, it is important to take extra precautions to protect the skin within the radiation treatment field from the sun. Just as chemotherapy affects hair because of the rapidly dividing hair follicle cells, it also affects nails. Nails may become darkened, brittle or cracked, and may also develop vertical lines or ridges. Nails may become pigmented or discoloured.The area around the nail bed may become dry, and cuticles may fray and the nail may fall off. Because the nail is not tightly bound to the nail bed, it can become a site for bacteria to enter. So be sure to practice excellent hygiene to avoid infection. There may even be multiple lines and indentations reflecting the different cycles of chemotherapy. Clip nails short. Do not bite or tear off any portion of the nail. Don’t cut the cuticles. Use cuticle remover cream or gels and push nails back gently.Massage cuticle cream into the cuticle area daily to prevent dryness, splitting, and hangnails. Wear nail polish to help keep nails strong and protected from the environment. To take off polish, use non-acetone-based remover which is less drying than acetone. Don’t use acrylics or other nail wraps. Fake nails can trap bacteria that may cause infection. If nails are very dry or falling off, then use nail moisturizer instead of polish. Excessive exposure to water can lead to fungal infections of the nail bed.